Draft: 2008, Los Angeles Dodgers, 25th rd. Gerald Robert Sands...Wife's name is Morgan...Is a 2005 graduate of Smithfield-Selma High School in Smithfield, NC (near Raleigh)... Established a school record 61 home runs while playing baseball at Catawaba College (NC) from 2006-08...Finished his college career ranked second in school history with 205 RBI...Earned First-Team NCAA II All-South Region honors in 2008 after batting .390 with 23 home runs and 80 RBI. Appeared in 50 games over two stints with the Indians … his contract was purchased from Class AAA Columbus on 4/10 … drove in four runs on 4/11 vs. Detroit. ... Was designated for assignment on 4/29 and outrighted to the minors on 5/3 … his contract was purchased a second time on 5/28 before being designated on 5/31 and outrighted on 6/6. ... His contract was purchased a third time on 7/31 and finished the season on the Indians major-league roster. ... Matched his career high with four RBI on 8/8 vs. Minnesota when he connected on a pinch-hit grand slam off Blaine Boyer in the fifth inning. ... Was designated for assignment a third time on 12/18 and claimed off waivers by the White Sox on 12/23. ... Was tied for sixth in the International League in walks (45) and seventh in home runs (14) at the time of his promotion to the Indians on 7/31. ... Hit .309 (17-55) vs. left-handers with the Clippers. Appeared in 12 games with Tampa Bay and 54 with Class AAA Durham before undergoing season-ending surgery.  Started the season with the Bulls before his contract was purchased by the Rays on 6/1. ... Recorded a pinch-hit, game-winning RBI in the eighth inning on 6/15 at Houston and 6/16 vs. Baltimore. ... Became the first player to record a game-winning RBI as a pinch hitter in consecutive team games since Atlanta's Howard Battle on 9/7-8/99 vs. St. Louis and the first in American League since Oakland's Harold Baines from 9/21-22/90 vs. Detroit. ... Hit a game-ending, pinch homer off Brian Matusz on 6/16 vs. Baltimore, the first pinch-hit and walkoff homers of his career. ... Was placed on the disabled list on 6/23 with a strained tendon in his left wrist and underwent season-ending surgery in July. Appeared in 106 games with Class AAA Indianapolis, including 73 in right field, 15 in left, seven at first base and five as the designated hitter. ... Also played in three games with the GCL Pirates during a rehab assignment (strained left hamstring). ... Was designated for assignment on 12/18 and claimed by Tampa Bay off waivers on 12/23. Spent majority of season with Albuquerque (Dodgers' AAA), where he led the Pacific Coast League in RBI and ranked third in home runs; his RBI total ranked seventh in all of Minor League Baseball...Recorded two triples on 5/3 vs. Oklahoma City...Homered twice on 5/13 at Salt Lake...Was hitting .364 in May and .257 in 36 games overall when he was recalled by Los Angeles on 5/15...Made start that night in left field and went 1-for-4 vs Arizona...Went 4-for-20 (.200) with two doubles in eight games with the Dodgers before being optioned back to Albuquerque on 5/29...Hit two grand slams and knocked in eight runs in the second game of a doubleheader at Nashville on 7/29...Was named PCL Player-of-the-Week for week of 7/23-30 after batting .389 (14-for-36) with three homers and 12 RBI in nine games...Was recalled by Los Angeles on 8/6 and started in right field that night vs Colorado (went 0-for-3)...Was optioned to Albuquerque on 8/8...Recorded a 21-game hitting streak at Triple-A from 7/27 to 8/20, which tied for the third-longest streak in the PCL...Batted .467 (42-for-90) during the streak - tops in all of Minor League Baseball - raising his average from .260 to .306...Hit nine home runs over 15-game span from 7/28 to 8/15, the most among Triple-A batters in that time...Had a season-high five hits on 8/20 vs. New Orleans...Batted .343 (73-for-233) from 7/1 thru the end of the season with Albuquerque...Collected 76 of his league-leading 107 RBI between 6/1 and 8/31....Made 60 appearances in left field, 44 at first base and 24 in right field while playing at the Triple-A level...Was named to the Pacific Coast League post-season All-Star team...Ranked fourth among players in post-season batting with a .381 (8-for-21) average and fourth with a .458 OBP...Was acquired by Boston on 10/4 as the player to be named later to complete the Adrian Gonzalez deal...Was acquired by Pittsburgh on 12/26 as part of a six-player deal. Arrived in the Majors in justhis fourth professional season,making his big league debut inApril and batting .253 with 15doubles, four homers and 26 RBIin 61 games over two stints withthe Dodgers...Appeared in 41 games (34starts) in left field, 22 games (16starts) in right field and six games(three starts) at first base...Batted .367 (22-for-60) withthree of his four home runsagainst left-handed pitchers...Hit the first home run of his career on May 21 at Chicago-AL with a solo shot off MarkBuehrle...followed it up with his first grand slam three days later off Houston's J.A.Happ on May 24 at Minute Maid Park...it was just the sixth grand slam by a Dodgerrookie since 1974 and the first since James Loney's on Sept. 28, 2006 at Colorado...Called up to the big leagues on April 18 and made his Major League debut thatnight against the Braves, starting in left field and doubling in his first at-bat against TimHudson...added a sacrifice fly in his second at-bat for the first RBI of his career...went1-for-3 in the game...Batted just .200 (25-for-125) with 10 doubles, two homers and 17 RBI in 41 gamesduring his first stint with Los Angeles and was optioned back to Albuquerque on June 9...Hit .313 (10-for-32) with two homers and five RBI in 22 Spring Training games as a non-roster invitee in his first big league camp...Recalled on Sept. 6 for a second stint with the Dodgers and hit .342 (25-for-73) with five doubles, two homers andnine RBI in 20 games down the stretch...Batted .431 (22-for-51) with five doubles, two homers and eight RBI during his career-long 14-game hitting streakfrom Sept. 12-26, which tied for the fifth-longest hitting streak by a Los Angeles Dodger rookie...Ranked fourth in the Triple-A Pacific Coast League with 29 home runs and had the fifth-highest slugging percentageon the circuit with a .586 mark in 94 games with Triple-A Albuquerque...led the Isotopes with 88 RBI and batted.278 with 21 doubles and three triples...His 29 home runs tied with Angelo Songco for the most by a Dodger minor leaguer and also ranked third in theorganization in RBI and fourth in slugging percentage...Called up to the big leagues on April 18 after hitting .400 with five homers and 17 RBI in his first 10 games of theseason at Triple-A...opened the season with a nine-game hitting streak and homered in four straight games from April9-12...had an .875 slugging percentage. Hit a combined .315 with 19 home runs and 58 RBI in 73 games for Rookie-advanced Ogden and Single-A GreatLakes...Began the season with Ogden and batted .350 with 14 home runs and 39 RBI...Would have tied for third in the Pioneer League with a .350 batting average if he had enough at-bats to qualify...Named to the Topps Short Season/Rookie All-Star Team and the Pioneer League All-Star Team, ranking fourth in theleague with 14 homers in 41 games...Batted .260 with five home runs and 19 RBI at Great Lakes in 32 games. Made his professional debut with the Rookie-level GCL Dodgers and batted .205 with 10 home runs with 33 RBI in46 games...Tied for second in the Gulf Coast League in home runs and tied for third in RBI. August 7, 2018 Sacramento River Cats released 1B Jerry Sands. July 12, 2018 1B Jerry Sands assigned to Sacramento River Cats from Richmond Flying Squirrels. April 1, 2018 1B Jerry Sands assigned to Richmond Flying Squirrels from Sacramento River Cats. 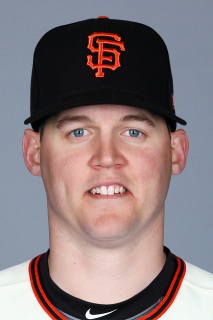 March 23, 2018 1B Jerry Sands assigned to Sacramento River Cats from Richmond Flying Squirrels. February 25, 2018 1B Jerry Sands assigned to San Francisco Giants. July 14, 2017 Richmond Flying Squirrels activated 1B Jerry Sands from the 7-day disabled list. July 1, 2017 Richmond Flying Squirrels placed 1B Jerry Sands on the 7-day disabled list retroactive to June 26, 2017. June 3, 2017 San Francisco Giants signed free agent 1B Jerry Sands to a minor league contract. June 3, 2017 1B Jerry Sands assigned to Richmond Flying Squirrels. October 6, 2016 1B Jerry Sands elected free agency. June 17, 2016 Chicago White Sox sent 1B Jerry Sands outright to Charlotte Knights. June 7, 2016 Chicago White Sox designated 1B Jerry Sands for assignment. December 23, 2015 Chicago White Sox claimed 1B Jerry Sands off waivers from Cleveland Indians. December 18, 2015 Cleveland Indians designated RF Jerry Sands for assignment. July 31, 2015 Cleveland Indians selected the contract of RF Jerry Sands from Columbus Clippers. June 6, 2015 Cleveland Indians sent RF Jerry Sands outright to Columbus Clippers. May 31, 2015 Cleveland Indians designated RF Jerry Sands for assignment. May 28, 2015 Cleveland Indians selected the contract of RF Jerry Sands from Columbus Clippers. May 3, 2015 Cleveland Indians sent RF Jerry Sands outright to Columbus Clippers. April 29, 2015 Cleveland Indians designated RF Jerry Sands for assignment. April 10, 2015 Cleveland Indians selected the contract of LF Jerry Sands from Columbus Clippers. December 15, 2014 Cleveland Indians signed free agent LF Jerry Sands to a minor league contract and invited him to spring training. December 15, 2014 DH Jerry Sands assigned to Columbus Clippers. November 8, 2014 LF Jerry Sands elected free agency. November 5, 2014 Tampa Bay Rays sent LF Jerry Sands outright to Durham Bulls. November 3, 2014 Tampa Bay Rays designated LF Jerry Sands for assignment. August 20, 2014 Tampa Bay Rays transferred LF Jerry Sands from the 15-day disabled list to the 60-day disabled list. June 1, 2014 Tampa Bay Rays selected the contract of LF Jerry Sands from Durham Bulls. January 9, 2014 Tampa Bay Rays sent LF Jerry Sands outright to Durham Bulls. January 7, 2014 Tampa Bay Rays designated Jerry Sands for assignment. December 23, 2013 Tampa Bay Rays claimed LF Jerry Sands off waivers from Pittsburgh Pirates. December 13, 2013 Pittsburgh Pirates designated Jerry Sands for assignment. October 31, 2013 OF Jerry Sands assigned to Indios de Mayaguez. October 12, 2013 Pittsburgh Pirates activated LF Jerry Sands. July 8, 2013 Indianapolis Indians activated LF Jerry Sands from the 7-day disabled list. July 2, 2013 Indianapolis Indians sent LF Jerry Sands on a rehab assignment to GCL Pirates. June 19, 2013 Indianapolis Indians placed LF Jerry Sands on the 7-day disabled list. March 13, 2013 Pittsburgh Pirates optioned LF Jerry Sands to Indianapolis Indians. October 4, 2012 Los Angeles Dodgers recalled LF Jerry Sands from Albuquerque Isotopes. October 4, 2012 Los Angeles Dodgers traded RHP Rubby De La Rosa and LF Jerry Sands to Boston Red Sox. August 9, 2012 Los Angeles Dodgers optioned Jerry Sands to Albuquerque Isotopes. August 6, 2012 Los Angeles Dodgers recalled Jerry Sands from Albuquerque Isotopes. May 29, 2012 Los Angeles Dodgers optioned Jerry Sands to Albuquerque Isotopes. May 15, 2012 Los Angeles Dodgers recalled Jerry Sands from Albuquerque Isotopes. March 27, 2012 Los Angeles Dodgers optioned Jerry Sands to Albuquerque Isotopes. October 14, 2011 OF Jerry Sands assigned to Tigres del Licey. September 6, 2011 Los Angeles Dodgers recalled Jerry Sands from Albuquerque Isotopes. September 6, 2011 Jerry Sands assigned to Los Angeles Dodgers. June 9, 2011 Los Angeles Dodgers optioned Jerry Sands to Albuquerque Isotopes. April 18, 2011 Los Angeles Dodgers selected the contract of Jerry Sands from Albuquerque Isotopes. April 5, 2011 Jerry Sands assigned to Albuquerque Isotopes from Chattanooga Lookouts. January 26, 2011 Los Angeles Dodgers invited non-roster LF Jerry Sands to spring training. August 31, 2010 Jerry Sands assigned to Phoenix Desert Dogs. June 24, 2010 Jerry Sands assigned to Chattanooga Lookouts from Great Lakes Loons. March 21, 2010 RF Jerry Sands assigned to Los Angeles Dodgers. August 8, 2009 Jerry Sands assigned to Great Lakes Loons from Ogden Raptors. June 23, 2009 Jerry Sands assigned to Ogden Raptors from Great Lakes Loons. May 8, 2009 Great Lakes Loons placed Jerry Sands on the reserve list. April 27, 2009 RF Jerry Sands assigned to Great Lakes Loons. June 10, 2008 Los Angeles Dodgers signed LF Jerry Sands.